Enter the BSHM maths competition for schools! Have you ever wondered what the world would be like without mathematics? And who are the people who make new mathematics and how they do it? 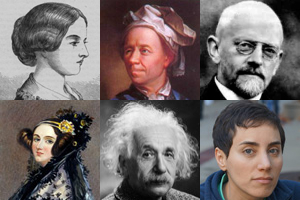 Who is your favourite mathematician of all time? This competition, organised by the British Society for the History of Mathematics, is your chance to explore how mathematics has developed and achieved its status and who were the most important mathematicians in history who contributed to it. This year we would like you to concentrate on choosing one mathematician who has, in your opinion, been the most important person, your favourite, and to make the case for your choice — to explain his/her mathematics and to show their importance or what you think was special about it and them. The British Society for the History of Mathematics (BSHM) believes that understanding where mathematics comes from and who has contributed to the development of mathematical ideas is an important part of understanding mathematics today. BSHM, working with Plus, invites secondary school students to explore this question and communicate their findings for a wide audience (age 16 upwards). You could write an article (maximum 1500 words), make a short video (maximum ten minutes) or a multi-media project (maximum ten minutes). The competition is open to all young people aged 11 to 15 and 16 to 19 who are in secondary education. A number of monetary prizes will be awarded, depending upon the quality and the number of entries. The maximum prize will be £100. The deadline for entries is Friday, 1st September 2019. All the info about how to submit your entry and where to ask questions is on the BSHM website. Winners will be notified to collect their prizes in London, at the Society's Gresham College meeting on the 23rd October 2019, and the recording of this will be posted on the BSHM website, with a link given also from Plus. Caucher Birkar won a Fields Medal at this year's International Congress of Mathematicians. He received the prestigious prize for his contributions to an area of maths called algebraic geometry. In this video he tells us about his work and his unusual mathematical journey. You can find out more about Birkar's work in this article. You can see all our coverage from the ICM 2018 here. The International Congress of Mathematicians opened this morning in a packed amphitheatre, bathed in green light and the sounds of the rain forest. The ceremony celebrated the best of Brazilian talent and creativity and the emphasis of the organising committee on building a legacy for the future of mathematics in Brazil. It was particularly lovely to see the 576 gold medallists from the Brazilian Mathematics Olympiad in the crowd, perhaps some of them will take the stage at some future ICM. Caucher Birkar — Caucher Birkar has been awarded the Fields medal for his contribution to algebraic geometry. Alessio Figalli — Alessio Figalli has been awarded the Fields medal for his contributions, among other things, to optimal transport theory. Peter Scholze — Peter Scholze has received the Fields medal 2018 for transforming arithmetic algebraic geometry. Akshay Venkatesh — Akshay Venkatesh has been awarded the Fields medal 2018 for his work exploring the boundaries of number theory. Constantinos Daskalakis – winner of the Rolf Nevanlinna Prize for outstanding contributions on the mathematical aspects of informational sciences. David Donoho – winner of the Carl Friedrich Gauss Prize for scientists whose mathematical research has had an impact outside mathematics. Masaki Kashiwara – winner of the Chern Medal Award, awarded to mathematicians whose accomplishments warrant the highest level of recognition for outstanding achievements in the field of mathematics. Ali Nesin – winner of the Leelavati Prize for increasing public awareness of mathematics as an intellectual discipline and the crucial role it plays in diverse human endeavors. It's been a joyous start to the congress, stay tuned for more stories! 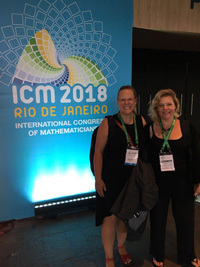 The International Congress of Mathematicians (ICM) is set to begin today, August 1 2018, in Rio de Janeiro, Brazil. Over the next nine days thousands of mathematicians from all over the world will share their work and also honour some of the best talent in the field. The ICM sees the award of the Fields medals, awarded every four years to up to four mathematicians under the age of 40 and regarded one of the highest honour in mathematics, as well as a range of other highly regarded prizes. Plus has reported on the last two ICMs (in India and South Korea) and we are very pleased to be present at this one too. Over the next ten days we will bring you up to date news from the congress, starting with the announcement of the prize winners tomorrow. We are very grateful for the generous support of the London Mathematical Society and the Institute of Mathematics and its Applications. Welcome to the FIFA World Cup! Finally the wait is over! The first match of the FIFA World Cup 2018 is just about to kick off in Moscow. With all the emotion and excitement that is to come, we thought that a little football-related maths might come in handy. What could be more relaxing and intellectually stimulating? From making penalties fairer and taking the perfect free kick, to designing an ideal ball and predicting results using an octopus, it's all there in our collection of football articles. Take your pick! Is the proposed ABBA rule for penalty shootouts really fairer than the existing rule? Maths shows that it is, and also suggests another, more subtle rule. Where in the goal should you aim a penalty at? A little geometry goes a long way in finding the answer. "It's failure to prepare mentally and failure to take practicing penalties really seriously." This is Plus author Ken Bray's explanation for England's dismal performance in penalty shootouts. Bray, who also wrote the article above, talks some more about penalties in this video. Free kicks deliver much of the drama in football. But how should strikers approach them and how does the design on the ball impact on its behaviour in flight? Find out more in this article. When is a goal not a goal? Remember Frank Lampard's disallowed goal in the 2010 World Cup match against Germany? The ball hit the crossbar, landed well behind the line but then bounced out again. And it all happened too quickly for the ref to spot it was a goal. How these kind of (non)-goals happen and what can we do about them? What makes a perfect football? It must be round, retain its shape, be bouncy but not too lively and, most importantly, be capable of impressive speeds. We find out that this last point is all down to the ball's surface, the most prized research goal in ball design. Learn about the aerodynamics of footballs and perfect your free kick. The way many football leagues schedule their fixtures can lead to unfair effects — and unsolved maths problems! Dries Goossens, who schedules the Belgian Pro League, explains. England's performance in the 2010 World Cup was thankfully overshadowed by the attention given to Paul the octopus, who was reported as making an unbroken series of correct predictions of match winners. But how psychic was Paul, really? Our fellow maths journal Aperiodical is coordinating a distributed Wiki Edit Day on Saturday 12th May (the birthday of mathematician Florence Nightingale). They are inviting as many people as possible to join in, from wherever they are, to edit and improve the presence of female mathematicians on Wikiquote's maths quotes page, and possibly to continue editing elsewhere on Wikimedia. The editing will happen on Saturday 12th May 2018, from 10am-3pm. Join in by loading a shared Google document from 10am on 12th May, finding things to add (and references), and making edits to the pages. Local editing sessions will be organised in different locations, and details will be shared in the doc, as well as a link to a video Hangout everyone can join in with to discuss edits. "I attribute my success to this – I never gave or took any excuse."